In celebration of their fifth anniversary, Lights All Night is putting on one of the most incredible New Year’s Eve festivals in the Southwest. With over 45 artists over the span of two days, the Dallas Convention Center is about to have it’s foundation rocked to its core. Not only will Lights All Night 2014 feature some of today’s biggest headlining acts like Skrillex, Disclosure, Zedd, and Armin Van Burren, the NYE festival will also feature some of the best young talent like Botnek, Christian Martin, and a Just Noise To Me favorite, Brazzabelle. On top of that, LAN is also the place to catch some of the best local Texas talent like Trill Wave, Left/Right, Paradise and more. 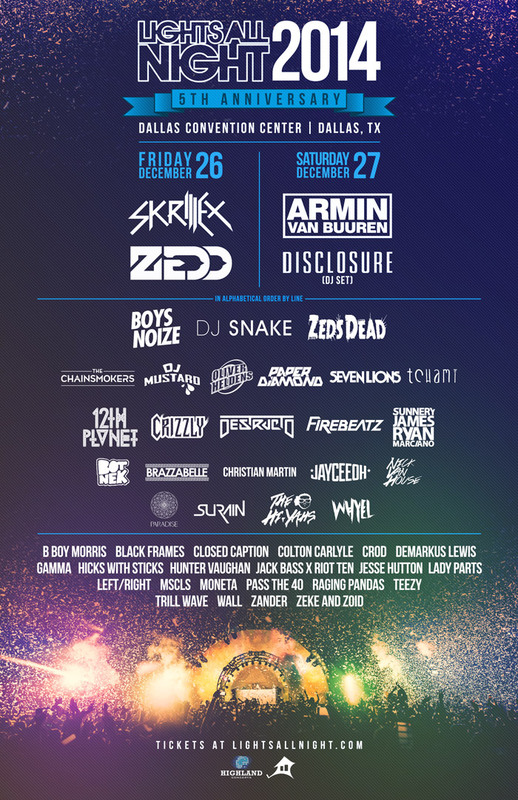 Lights All Night 2014 will be held Friday, December 26th and Saturday, December 27th at the Dallas Convention Center in Dallas, Texas. This is going to be one New Year’s event you do NOT want to miss. Celebrate LAN’s 5th year anniversary and buy your tickets today! Stay tuned to Just Noise To me for daily lineups, schedules, and even more artist announcements!